The TENS 7000 To Go Back Pain Relief System is a doctor recommended, over-the-counter (OTC) TENS device that provides prescription-strength pain relief associated with sore and aching muscles in the lower back. This easy-to-use device comes equipped with a conductive electrode support belt that transmits the current directly to the pain site. With five preset therapy modes, you can quickly customize your therapy and target your back pain. Comes complete with TENS 7000™ device, conductive electrode support belt, conductive spray, snap-on lead wire, a 9-volt battery and user manual. FDA cleared for over-the-counter sale, a great retail item. TENS/EMS Units & Stimulators can be found in our extensive online collection of products from globally recognized and trusted brands, including Current Solutions. 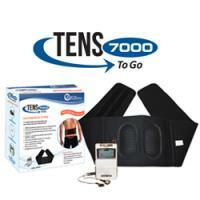 An excellent option to consider is the TENS 7000 To Go Back Pain Relief System. 10.5" x 10" x 6.5"